As early as 1849, small pioneer cemeteries could be found scattered throughout the area that is now Duluth. One of the earliest cemeteries for pioneers and fur trappers of European descent was located at Fond du Lac just outside the Astor Fur Trade Post; Native Americans were buried nearby. When the Lake Superior and Mississippi Railroad was built through Fond du Lac in 1870, its tracks were laid right through the burial grounds. The bodies of pioneers and Native Americans alike were relocated to a new cemetery further up the hill. This location became known as the “Pioneer Cemetery” or the “Roussain Cemetery” because it contains the remains of the children of pioneer Francois Roussain, and the granite marker above their common grave is prominent among the other headstones. Another Native American cemetery on the Point was located close to today’s Sky Harbor Airport. 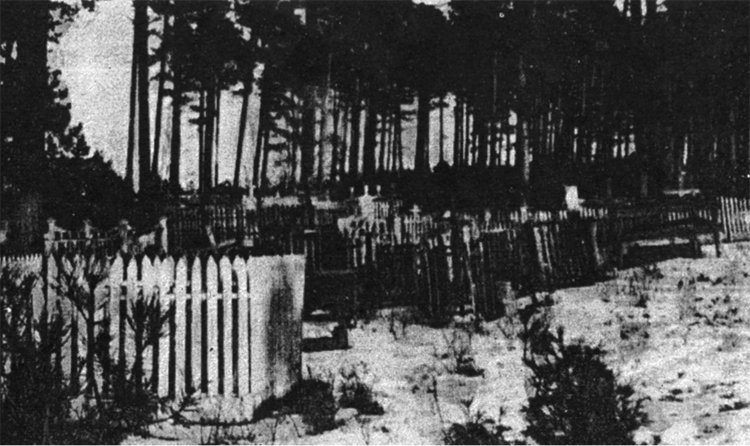 Photos from the 1870s show the fenced burial sites. It is believed that a few of the earliest white settlers were buried here as well. Another cemetery lay between what is now 12th and 13th Avenues and Lake and Minnesota Avenues. Here white settlers were buried as early as 1869 until Forest Hill opened and the bodies were moved. A railroad crew uncovered another Native American burial ground in 1870 on Rice’s Point. Workers found tomahawks, a brass kettle, and other objects. Based on the size of trees growing on the site, it was estimated the bodies had been buried about 100 years. Judge John Carey brought his family to Oneota in 1857; his memoir of Duluth’s early years mentions a graveyard at about 45th Avenue West along the bay. This too was thought to have been a Native American site. An early Catholic cemetery called “Calvary” was established in 1881 on eleven acres at the top of 12th Avenue East, but closed in 1914 when the diocese built the Thomas Feigh Hospital for Crippled Children (now Summit School) on the site. Bodies buried there were moved to the new Calvary Cemetery that was established on the border with Rice Lake Township in 1892. Prior to 1881, Catholics were buried in the churchyard behind the first Sacred Heart Church at 4th Street and Second Avenue West. Native Americans and early white pioneers were buried in still other locations in what is today’s Duluth before the formal, planned cemeteries were established. In fact, prior to 1872, some of Duluth’s early pioneers were interred on residential lots.